When you sync files by using the OneDrive desktop app, you can choose how much of your network bandwidth you use. If you're syncing work or school files and don't see the Network tab, the settings are managed by your IT department. 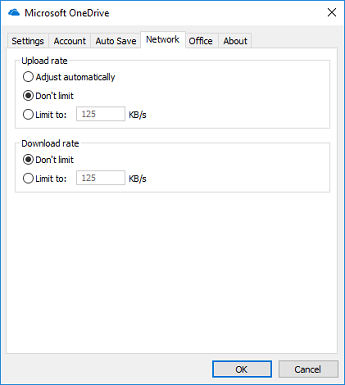 Select an option under Upload rate and Download rate, and then select OK.
You can limit the upload and download throughput to a fixed rate (The minimum rate is 50 KB/sec and the maximum rate is 100,000 KB/sec). The lower the rate, the longer it will take your files to upload and download. Instead of limiting upload throughput to a fixed rate, you can also set it to "Adjust automatically." This changes the rate to match your current network conditions. When you select this option, the OneDrive desktop app can use up to 70% of the maximum available throughput for uploading files. To determine the maximum available, the OneDrive desktop app measures how fast content uploads over 60 seconds. Then the sync client multiplies the peak during that time period by 70% and uses it as the limit for the next 10 minutes. After 10 minutes, the sync client measures again and determines a new limit. During the measurement periods, the upload rate isn't limited. If you're on a slow network temporarily, you can pause syncing instead of setting limits on the upload and download rates. 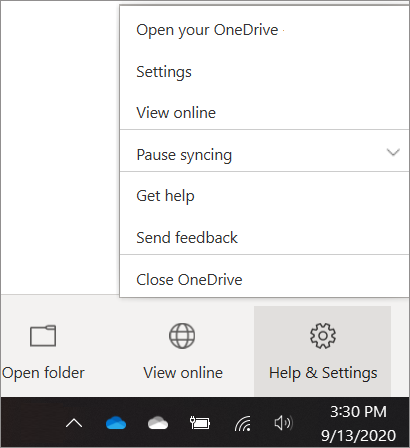 To do this, click the OneDrive icon in the notification area on your taskbar, select More in the activity center, click Pause syncing, and then select how long you want to pause syncing. If you have large files to upload, try to do so when you're on a fast network.